It was exciting to learn Wednesday that Oakland was selected as one of the ten winners in the XQ Project’s Super Schools competition. The announcement is reflective of the great work educators, students and families have done that are making Oakland a national focus for efforts that improve schooling, especially for underserved students. The XQ project hopes to “remake America’s high schools” by creating new models of learning. Their Super Schools competition was a national search for the best ideas that support students through innovation and collaboration. Oakland was among 10 places that won the national competition, which drew hundreds of applicants. 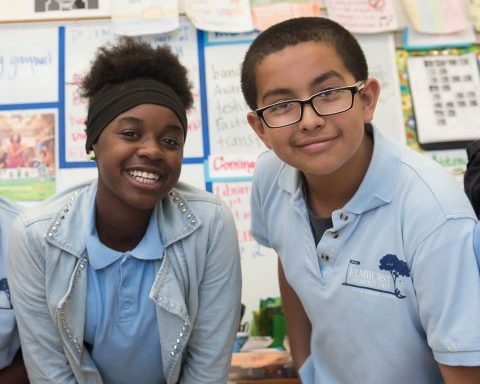 The winning Oakland project is a partnership with Summit Public Schools, a network of public charter schools that has done cutting-edge work to help teachers tailor learning to students’ individual needs, in environments that emphasize support and real-world connections. The schools are also intentionally diverse: administrators ensure that students of different races, cultures, income levels, languages and living experiences are learning together. Oakland schools like Urban Promise Academy, Roosevelt Middle School, and McClymonds High School have already partnered with Summit in the past to integrate these ideas into their learning models. For the competition, Summit envisioned a school where students would benefit not only from individualized learning plans, but also from a community of supportive advisors who help guide their real-world learning. Summit will receive $10 million over five years to make this vision a reality. But the real payoff of this project isn’t just about creating one school. The XQ Project will help put Oakland on the cutting edge of learning new strategies that will ultimately benefit all kids in our community. To learn more about the project, visit the XQ Project website. You can also watch the announcement of competition winners on their Facebook page. This was not the only recognition that Oakland educators received on Wednesday for the good work happening around our city. Oakland International High School was also one of 20 schools across the country to be named a “School of Opportunity” by the National Education Policy Center. The designation honors public schools that have successfully helped close opportunity gaps in education. Read more about that project.